Bhopal, July 31, 2016 (Muslim Saleem): Madhya Pradesh earned the distinction of being conferred five awards for excellent performance in tourism sector at National Tourism Award function held in New Delhi today. These awards include the National Award of Best Tourism State. The award function was organized at Vigyan Bhawan, New Delhi by Union Ministry of Tourism. Lok Sabha Speaker Mrs. Sumitra Mahajan and Union Minister of State for Tourism & Culture (independent charge) Dr. Mahesh Sharma presented these awards to Madhya Pradesh Minister of State for Culture and Tourism (independent charge) Mr. Surendra Patwa, Chairman of Madhya Pradesh State Tourism Development Corporation Mr. Tapan Bhowmik; Managing Director Mr. Hari Ranjan Rao and Additional Managing Director Miss Tanvi Sundriyal. The awards comprise trophies and letters of citation. 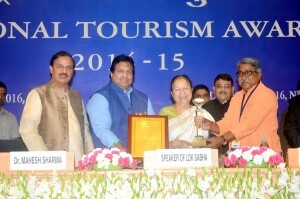 Besides, Madhya Pradesh was also conferred with two other tourism awards. One of these is for making Amarkantak disabled-friendly and the other for best heritage walk in Bhopal. The Best Tourist Guide award was presented to Mr. Jeevan Jyoti Pateria. Madhya Pradesh boasts of unmatched historical heritage, religious places, eco tourism points and National Parks to mesmerize tourists. They get their adrenaline flowing the moment they enter these tourism delights. Tourism department has developed the temples at Amarkantak disbaled friendly. For this, wheel chairs have been made available, notice boards and signages in Braille have been put up and literature about these temples has been published in Braille. Disabled friendly toilets have also been constructed. In Bhopal a number of paths have been developed for heritage walk. Through this the history of architecture of Bhopal has been shown. The first path starts from Kamlapati Mahal and via Upper Lake towards Sufi masjid and Sadar Manzil and the second path showcases the history of Taj-ul-Masajid.